Carnival Horizon which is the newest Carnival cruise ship has recently passed its very first United States Public Health (USPH) inspections. The ship received a good score and hopefully, the trend will continue through to the next inspections. The ship only entered service in April 2018 and has got off to a great start with USPH inspections. When the Carnival cruise ship was docked in San Juan, Puerto Rico on July 27 the unannounced inspections took place. We were told from a source working onboard the ship that they had hardly any notice but the port agent noticed the inspectors from the CDC on the pier and then informed the ship. Apparently, the port agent saw the USPH guys on the pier and called the ship. So they had about 1 to 2 hours notice. 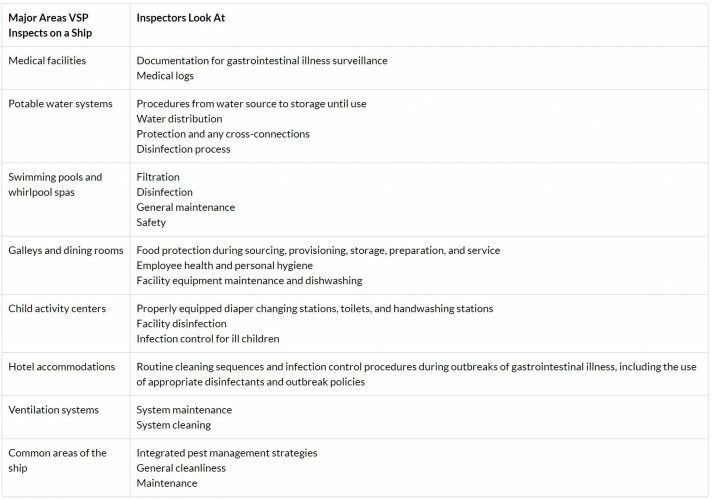 USPH inspections take place only on cruise ships which sail to U.S. ports and they take place twice a year but this does depend on the ship deployment. If a ship received a score of 85 or less then it’s classed as a failure and urgent action must be taken to fix the issues. Carnival Horizon is currently based out of New York City after completing a transatlantic voyage at the Start of May. The ship is on the final days of an 8-night Eastern Caribbean cruise and is scheduled to arrive back in New York on July 31. She is the sister ship to Carnival Vista at 133,500 gross tons and with a guest capacity of 3,900. We must congratulate all the hard-working team members aboard the Carnival cruise ship. Making sure the ship is in perfect condition at all times can be tough and if USPH inspections are due crew members often work extra shifts to make sure procedures are followed and everything is looking shiny and new!